Pack of 36 Disposable Bed Mats (Individually Wrapped). Each mat measure 30" in length x 36" in height to fit across a twin-size bed. Made with a soft, quiet material that helps your child sleep comfortably. The #1 NightTime Protection Brand*, with Micro-Pocket Technology for trusted nighttime protection. Adhesive strips help keep the incontinence mat securely in place on top of your child's bed sheet (recommended for use on 100% cotton/flannel sheets). Features the same super absorbent technology as LXL GoodNites Bedtime Pants. Pack of 36 Disposable Bed Mats (Individually Wrapped). Each mat measure 30" in length x 36" in height to fit across a twin-size bed. Adhesive strips help keep the incontinence mat securely in place on top of your child's bed sheet (recommended for use on 100% cotton/flannel sheets). 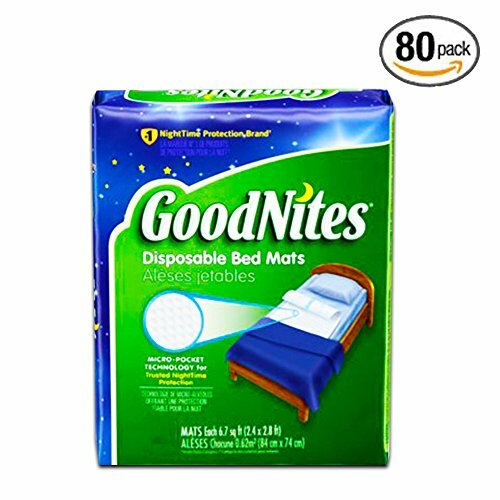 Features the same super absorbent technology as LXL GoodNites Bedtime Pants. Made with a soft, quiet material that helps your child sleep comfortably. The #1 NightTime Protection Brand*, with Micro-Pocket Technology for trusted nighttime protection. If you have any questions about this product by GoodNites, contact us by completing and submitting the form below. If you are looking for a specif part number, please include it with your message.